Jake Peterson's Blog » That Mustang can Move! One of the many things that I still find fascinating about photography is how you can photograph the same subject in different ways and get very different results. Take this Mustang for example. Usually you tend to photograph it while looking up, that’s the most common way to photograph any plane at an airshow. But when you have the opportunity to do an air to air shoot and you get to look at the plane in a whole new way, that photograph changes. When we were doing a first multiple ship formation we had a breif where we planned certain shots with certain planes. 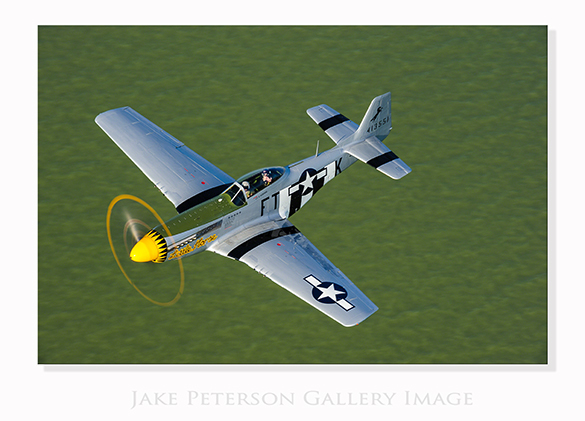 This mustang, known as “Little Horse,” part of the Texas Flying Legends fleet, was only needed for the early part of the shoot and what you see here is Mark breaking away and heading back to home base. Looking down on the subject is always fun. It’s also not something you see as often. It does provide one of the perspectives that is always desirable, speed. These planes move fast and anyway to show that speed makes for a more dramatic photograph. The greenish, brownish background of Galveston Bay just blurs out as the mustang slides away from the rest of the group. Having a full prop blur doesn’t hurt either. Then again, that’s another part of the story that you can choose to do with as you want.